The heart rate monitors built into the Apple Watch and other wearable devices can detect abnormal heart rhythms with 97 percent accuracy, according to a new study conducted by the team behind the Cardiogram app for Apple Watch in conjunction with researchers at the University of California, San Francisco. More than 139 million heart rate and step count measurements were collected from 9,750 users of the Cardiogram app who also enrolled in the UC San Francisco Health eHeart Study, with the data used to train DeepHeart, Cardiogram's deep neural network. Once trained, DeepHeart was able to read heart rate data collected by wearables, distinguishing between normal heart rhythm and atrial fibrillation with a 97 percent accuracy rate, both when testing UCSF patients with known heart issues and Cardiogram participants. 97% accuracy refers to the c-statistic, or area under the sensitivity-specificity curve. Surprisingly, both the sensitivity and specificity of DeepHeart were even higher than an FDA-cleared Apple Watch ECG attachment -- 98% (vs 93%) sensitivity and 90% (vs 84%) specificity. Published in JAMA Cardiology this morning, the study confirms the results from a similar preliminary study done in May of 2017. According to Cardiogram, today's study marks the first peer-reviewed study in a medical journal that demonstrates popular wearables from companies like Apple, Garmin, Polar, LG, and others can detect a major health condition. This proof-of-concept study found that smartwatch photoplethysmography coupled with a deep neural network can passively detect AF but with some loss of sensitivity and specificity against a criterion-standard ECG. Further studies will help identify the optimal role for smartwatch-guided rhythm assessment. 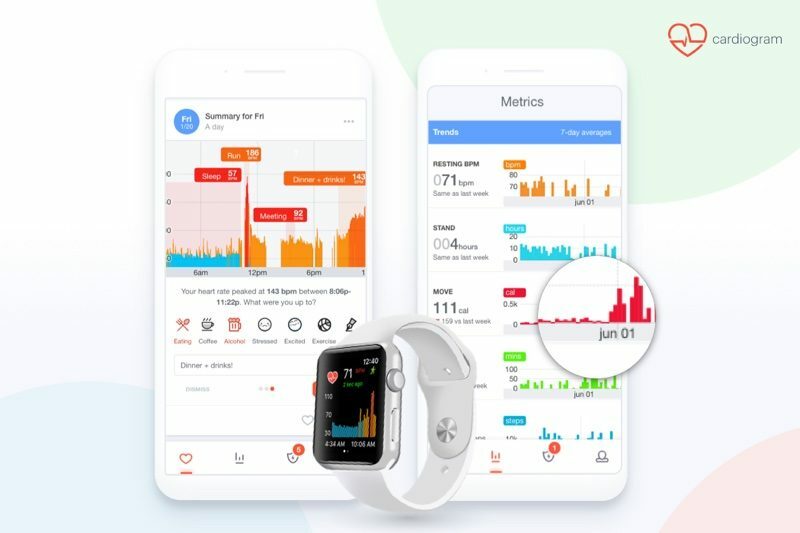 In addition to studies on the Apple Watch's ability to detect atrial fibrillation, Cardiogram and UCSF have also been working to determine if the Apple Watch heart rate monitor can also detect conditions like hypertension, sleep apnea, and early signs of diabetes. Preliminary studies have suggested all of these conditions could be spotted in data collected by Apple Watch and other common wearable devices. Apple has been working with researchers at Stanford on its own study to determine whether the heart rate sensor in the Apple Watch can be used to detect abnormal heart rhythms and common heart conditions. While in the study, if an abnormal heart rhythm is detected, participants will be contacted by researchers and asked to wear an ePath monitor to test heart health. Apple Watch owners can sign up to participate in the Apple Heart Study by downloading and installing the Apple Heart Study app. Those who want to join Cardiogram's studies can install the Cardiogram app and sign up to join the mRhythm study. Another paid research. It's the same off-the-shelf HRM as other watches. Seems like you can't read, there are other brands mentioned/involved in the article, like LG and Polar amongst others. (Macrumors) today's study marks the first peer-reviewed study in a medical journal that demonstrates popular wearables from companies like Apple, Garmin, Polar, LG, and others can detect a major health condition. Why so negative, I think this is a good thing. My AW3 is a requirement by my wife after my heart attack a while back. I wear it while I sleep and have it set to alert me if my HR goes above 120. When I was ill and had a fever, my HR went up and over 120 a few times and I had the watch wake me while I was trying to rest. This does make wife and I feel better about having some kind of warning that I may need to seek medical attention. For that, the price of AW3 is definitely worth it for me despite the naysayers. Personally I don't find the Apple Watch heart rate sensor to be that accurate. When working out, it will regularly be off by a factor. To me, this means it's missing every other heartbeat. For example, my resting is ~70; when doing a cardio workout it will go up to 150 or so, then suddenly down to 75. Definitely not right, I am in the middle of cardio and feeling it, it's not 75. Is the watch tight enough? That usually solves the problem. I went out drinking with co-works one evening after work and my watch alerted me that my heart rate was over 120/125 or whatever it was. Was it because I was drinking or was it an error? That's a great story. Thanks for sharing! This is a big deal medically. It’s really difficult to detect atrial fibrillation in many patients because it is intermittent. The longer you record heart rate/EKG the easier it is to detect-like months. Wearing an Apple Watch is cheap and easy to do. I spent zillions looking for afib over the years in stroke patients. If you detect afib in patients before stroke, you could offer anticoagulation to lower the risk of stroke ever happening. But you can’t test the general population for weeks on end with current methods. I workout with a Garmin chest strap heart monitor and an Apple Watch. The two are rarely more than a few beats off from each other. Why not maybe read the article? It says right there its multiple OEMs.. The sentence in the article actually did say ‘Apple Watch and other wearable devices’.